Middlesbrough's poor form in 2013 continued as they lost to Millwall. 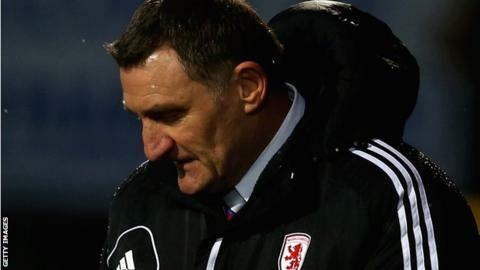 Tony Mowbray's side, with just one win so far this year, fell behind when George Friend headed James Henry's cross into his own net. Martyn Woolford made it 2-0 just before the break, firing in after Jason Steele denied Benik Afobe. Curtis Main finished from two yards and Middlesbrough thought they had scored a late equaliser, but Scott McDonald's effort was offside. Millwall, like Middlesbrough, have struggled for form this year and went into the game on the back of five successive league defeats. They were the better side though and were the first to threaten in the 15th minute when Grant Leadbitter's free kick flew just wide. Millwall took the lead with their second chance on goal 10 minutes later. Henry sent an inviting cross into the area where the unfortunate Friend, under pressure from Afobe and John Marquis, sent a header beyond his own keeper. The home side almost immediately restored parity but Main's powerful header from Leadbitter's corner was blocked on the line by Nadjim Abdou. Instead, Millwall added to their advantage five minutes before the break. The lively Afobe's shot was pushed away by Steele and the stranded keeper could only watch on as Woolford sidefooted the loose ball into the net. With nothing to lose, Middlesbrough pressed forward in search of a goal and it duly arrived 15 minutes before time as Main tapped in after being picked out by Friend. That set up a tense finish and Millwall were left hanging on at the end. Middlesbrough players were briefly celebrating in stoppage time when they though McDonald had turned in a late equaliser, but it was ruled out. "They were poor, poor goals for us to concede from a defensive point of view. We made it very difficult for ourselves. "We didn't get the luck but we can't keep saying that. It is down to us to win football matches. "Of course we are very disappointed and of course it has an effect on confidence. And of course it is very frustrating for the supporters here who have seen these results over the past few weeks. But do we still believe we can make the play-offs? Of course we do." "It was a fantastic result and a great performance. Middlesbrough is a very difficult place to come and get a result so we have got to be delighted with it. "We made a few changes and we went with two up top and it paid off for us. The boys worked very hard for it. It was a honest performance. "Having looked at it I thought the one at the end was definitely offside. The officials got it right."